The traditional thinking is, never wear linen clothing before Memorial Day or after Labor Day. While most people adhere to this, there really is no reason – especially in Southern California – not to wear it year round. So, get your “summer” linens out and enjoy the light, airy feeling of this natural fabric. 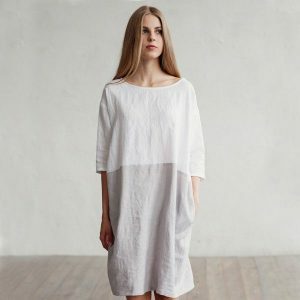 Linen is a light, breathable textile woven from fibers of the flax plant. It has been around for at least five millennia. Ancient Egyptians used it as currency. Its thread comes from the stem’s cellulose fiber. This thread is the foundation for fine toweling, bedding, and dress fabrics. Poland, Austria, France, Germany, Denmark, the Netherlands, Italy, Spain, and Switzerland all grow flax for linen. However, the finest-quality fibers in the world come from Belgium, with Scotland and Ireland not far behind. Set your iron to the highest heat, and turn on the steam. Wet a cotton towel or T-shirt and place it over your linen garment. Iron. The result will be smooth, unscorched linen. Or, bring it to your local Flair Cleaners for a quick touch-up. Remember, once you put it on linen will begin to crease immediately! Machine or hand wash home linens, like bedding and towels, that have been properly manufactured and treated. Tumble dry on low temperatures. Dry clean structured, tailored items such as linen jackets or suits. Always follow the care instructions on your items and test any cleaning method on a small, hidden area before washing the entire piece. When in doubt, check with the professionals at Flair.